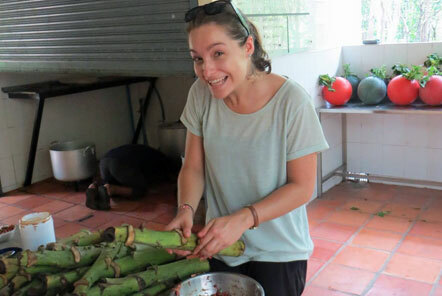 Becky visited the Bear Rescue project in Cambodia - she has shared her experience of a typical day. “I was met at my hotel by a mini-van full of smiley-faced staff and volunteers, we headed straight out of the city and down to the volunteer house to get settled in. The house is situated in a beautiful rural area, just 30 minutes from Phnom Penh, turning off of the main highway the minivan took a small un-named track, past a temple and a small lake, and pulled up to a large Cambodian style house nestled amongst the trees. The house is home to our volunteers and also Chris, the Volunteer Coordinator. 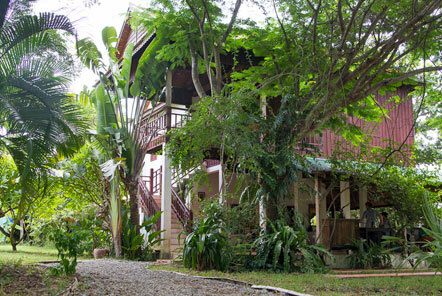 It has been constructed so that the ground floor is completely open which means it stays cool in the evening (even if there are the occasional lizards passing through) and there is an outdoor swimming pool at the back of the property which volunteers make full use of. Upstairs are the volunteer rooms, two large dorm rooms with a shared bathroom. It struck me that the house has the odd combination of being both very basic and a little bit luxurious (given the swimming pool) at the same time. The next morning we woke early to head off to the centre, I had breakfast at the house as well as some well-needed coffee, shook a frog out of my shoe and helped push the van out of a muddy patch before we were on our way! Arriving at the Bear Rescue project is quite special, the project is based at a wildlife centre which is home to a plethora of animals but as ‘staff’ of the bear enclosures, you get whisked straight through to their section of the centre – a huge area which cares for 130 bears each group divided into a numbered “House” with a dedicated keeper. In the morning I was working on composting, alongside one of the local bear keepers who has worked at the project for many years. His passion for the bears showed, he was keen to introduce me to each bear giving their name and approximate age – although his English is basic his passion was infectious. As we cleaned out each of the enclosures, I slowly acclimatised to the smell of bear faeces… a smell which is quite distinctive! Often in the afternoons volunteers focus on enrichments. I got my hands dirty, working with two other volunteers to make enrichments for the bears. We made three types of enrichment. First was the banana tree stalks; we mixed up a surprisingly delicious smelling cocktail of dog biscuits, mashed banana and honey. 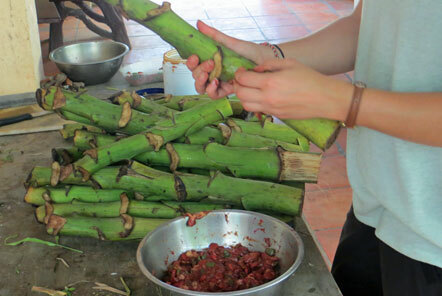 The Khmer staff then brought over some discarded banana tree stalks (waste from another part of the animal centre) which we cut crevices and holes into. These sticks could then be thrown into the enclosures later that day and the bears would spend a long time working the honey from all the gaps! Next up was the balls! 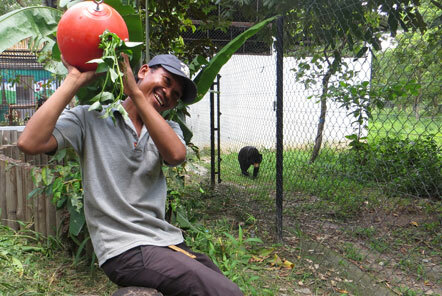 The centre have had amazing balls donated which are specially designed for animal enrichment, the balls can be filled up with a mixture of vegetation, dog biscuits and honey. We filled around 25 balls full of treats ready for the afternoon. 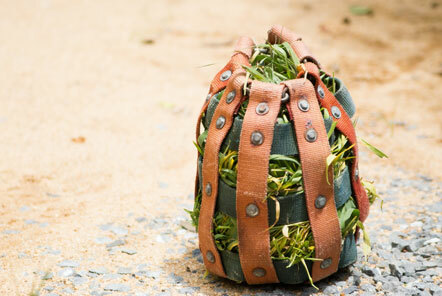 Third on the agenda were the grass sacks, layered with hidden treats. The grasses are a good nutrition for the bears but they tend to favour them less than other foods and so by hiding some fun items amongst the grasses the team can ensure they get a varied diet. Once this was all ready to go, we loaded up the cart and went out to distribute the enrichments. It was so rewarding watching the bears get excited and spending so much time and concentration on the different activities. 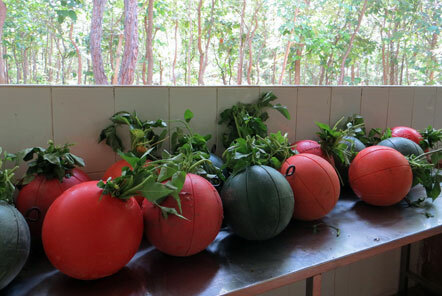 Each Bear House received a different treat and each day is varied, Mr Thol the head keeper said that the balls were the overwhelming favourite. 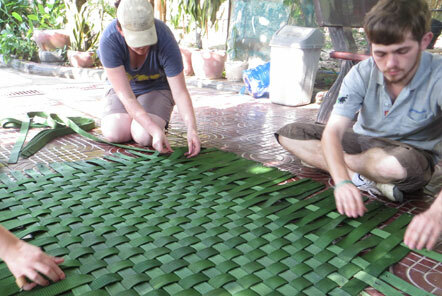 Finally we did some work in the late afternoon plaiting the hammocks used in the bear enclosures. 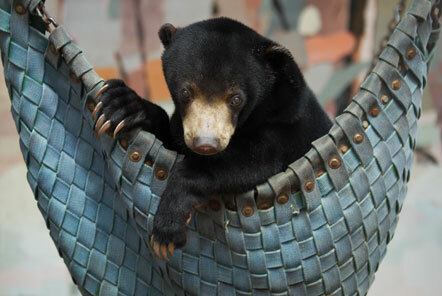 The bears love to be up high and so the hammocks are perfect for them. Once I got the hang of it, the process was quite therapeutic and we finished one that afternoon.